Tokay geckos (Gekko gecko) are beautiful, large lizards from Southeast Asia that can thrive as pets despite their aggressive dispositions. Though most tokay geckos offered for sale are wild-caught, these imported animals can thrive and some eventually become tame with proper husbandry and veterinary attention. Captive-bred animals are rarely available but are much easier to tame than their wild-caught counterparts. 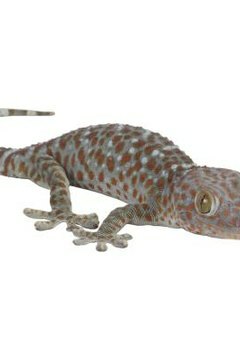 Attempt to handle and tame your tokay gecko only if he is healthy and well-acclimated. Unplug all lighting and heating devices from your lizards cage. Gently move the tokay gecko's cage to the work surface. Remove all extraneous items from the area, and quarantine the area from pets, children and other distractions. Dim the lights to make your lizard feel more comfortable. Don't make the lights so dim that you have trouble seeing, though; you will need to see your lizard clearly to interpret its behavior. Slowly open the cage. Completely remove the door or lid if it is feasible to do so. With or without the gloves, delicately place your flattened hand near the gecko. Don't touch the lizard yet; be patient if the lizard shows signs of aggression. If the lizard gapes his mouth or attempts to bite, keep your hand flat and still. After a few minutes, gently move your hand until it contacts the lizard. Stop at this point and allow your lizard to adjust to the contact; allow him to see, smell and lick your hand if he chooses to. Curiosity is a good sign. After several minutes of contact, slowly slide your hand under the gecko's chin. Keep your fingers together, and proceed gently; allow the lizard to move his grip from the cage walls to your hand. Once your hand is under the lizard's chin, gently apply upward pressure. At this point, the gecko will most likely crawl into your hand. Once the gecko is in your hand, allow him to crawl freely. The lizard will likely lick you as he explores; by becoming familiar with your scent, the lizard will begin to become more relaxed during handling sessions. After handling the lizard for a few minutes, gently return him to his cage. Move the cage back to his normal location, and replace all lighting and heating devices. Repeat the entire process two or three times per week until the gecko learns that you are no threat and willingly climbs into your hand when you offer it.  A lizard reacts aggressively when frightened; respond by pausing, then proceeding again slowly until you make a bit of progress.  The strategy for acclimating the tokay gecko works with similar species, including white-lined (Gekko vittatus) and golden geckos (Gekko baddeni).  Apply a little baby food to your finger to entice your gecko to climb into your hand.  Sometimes it helps to avoid looking directly at the lizard; instead watch out of the corner of your eye. ⚠ Never grab your lizard; he is sure to think you are a predator and respond accordingly. ⚠ Be sure that the work area is clear of debris and dangers in case your lizard decides to jump suddenly.